Gareth Johnson celebrated a successful Shock N Awe debut at Portsmouth Guildhall and insisted: It’s only going to get better. 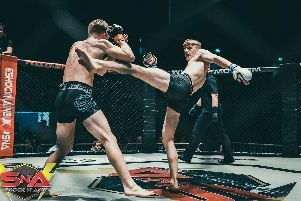 The south coast’s premier mixed martial arts (MMA) and kickboxing event made its bow in the historic venue for its 28th edition on Saturday. And the action-packed card proved a huge hit with the crowd. Having moved from the Mountbatten Centre, Johnson – head coach at Fratton’s Gym 01 – wanted to ensure things ran smoothly the first time in the new venue. That meant the trademark flames and pyrotechnics were not present. However, when Shock N Awe 29 takes place on Saturday, March 16, Johnson is certain they’ll be on display. The promoter said: ‘It was a bit surreal to think we were even doing it a show at the Guildhall as we come from quite humble beginnings. ‘We never set out to try to host a show on that level. Our original goal was to put on high-quality shows the fighters enjoyed and felt looked after at. ‘We go above and beyond with a lot of paramedics and doctors – a lot of shows don’t do that. ‘All of those aspects at the Guildhall worked out well. ‘Working with the Guildhall will allow me to elevate the show again because they’re one of the top venues in the south. ‘I’m looking forward to developing the brand because I know have the ability to do so with a venue like the Guildhall. ‘One of my favourite things as a promoter is to put on more of a show. ‘I didn’t use the flames and the pyrotechnics on this one because I was a bit worried about the proximity to the crowd. ‘So when the layout was done on Saturday I was able to do lots of drawing and take video to see where they could go for the show in March. ‘One thing we’ll be doing is upping the content, show we’ll be bringing back things like the flames and grander entrances, along with putting additional screens in. More than 1,000 people packed into the Guildhall. Johnson told how fans have previously turned up to only watch certain fights before leaving. That didn’t happen at Shock N Awe 28, however. ‘Normally what happens is people turn up, watch their fights and go.’ added the promoter. ‘But for the first time we had the largest amount of people in the venue for the longest period at one time. ‘I’ve never had that before. I said to the venue beforehand they’re never going to hit 1000 people at one time because we have a high turnover.